I hate that I cute her left toe off, but it seems that my agency like the shot enough to feature it on their blog. 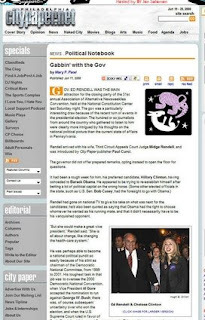 Although I took this April 18, it was used for this paper when Mary Patel wrote about Governor Rendell. I ran into Danny DeVito on my way home from work on Tuesday. Unbeknown to me he had just finished filming a segment from "It's Always Sunny in Philadelphia" in Logan Square, when I saw him posing with grads and shaking hands with the folks sitting on the park benches.